The Russian art market has cooled off after a ten-year period of rapidly ascending prices. Various reasons are given for this such the situation in Ukraine, the collapsing ruble and oil price and US-led sanctions. These all contribute to the real reason which is uncertainty. Many Russian art collectors have diversified outside of Russia, and out of the ruble, and buy the same basket of currencies, stocks, bonds and property as other investors and so they are no more affected by the above events than other international collectors who are pushing the contemporary art market to new highs. 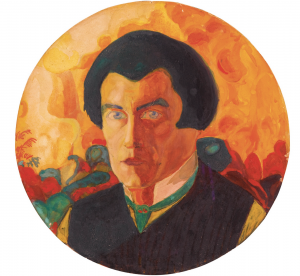 However, the uncertainty is making them cautious for the time being and, having been a major presence at the Impressionist and Modern art sales in recent years, they were much less in force at the sales in recent weeks. According to the auction houses they were repaced by Asian buyers. The only major picture they openly competed for was the Malevich self portrait which Sotheby’s had prudently put into an International as opposed to a Russian sale. This made 5,749,000 pounds against an estimate of 1,000,000 – 1,500,000 and had made 163,000 pounds in 2004. The US and Russia are locked in a power struggle at present in a continuation of the Cold War. In the short-term the US sanctions are damaging Russia and forcing closer Russian/Asian integration. How this all pans out in the long term is anyone’s guess but an Asian/Russian/Iranian axis with its own commercial treaties, currencies, and an alternative SWIFT system may become a formidable competitor to the USA. If so, contrarians might be tempted to load up on Ukrainian, Asian, Russian and Iranian assets, where allowed under the terms of US sanctions. In the following article in Russia beyond the Headlines, published Feb 9, Aliya Sayakova interviews the collector Alexander Ivanov best known for his Faberge Collection. “The last big sales in London in November reflected the deepening crisis in Russia. Major auction houses failed to sell between 40 and 60pc of lots offered. Although a new record was set when Valentin Serov’s Portrait of Maria Zetlin sold for £9.2 million, well above its £1.5-2.5 million estimate, even that could not hide the lacklustre atmosphere. Economic cycles seem to leave some Russian collectors untroubled, among them wealthy former computer businessman Alexander Ivanov, a regular presence at London’s biannual Russian Art Week. Ivanov spends a couple of million pounds per visit and buys just about anything: Old Masters, European jewellery, Pre-Columbian gold, Russian icons. However his true love is Fabergé. Ivanov is a founder of the Fabergé museum in Baden-Baden, the German spa town. Opened in 2009, it is home to Ivanov’s ever-growing collection of rabbits, decanters, gold flowers, clocks, and other notable pieces by the Russian Imperial goldsmith. Ivanov’s most important purchase to date was in 2007 when he paid £9m at Christie’s for a 1902 Fabergé egg made as an engagement gift for Baron Edouard de Rothschild, a scion of the French banking dynasty. The gold-and-pink enamel egg and clock with a diamond-set cockerel that pops up on the hour was completely unknown until it resurfaced at auction a few years ago. A highlight of Ivanov’s collection until recently, the fabulous ornament is now on show in the Throne Room of the State Hermitage Museum in Saint Petersburg, having been formally presented December 8 by Russian President Vladimir Putin to mark the Hermitage’s 250th birthday. In 2007 Alexander Ivanov paid 9m pounds for a 1902 Faberge Egg at Christie’s that had been made as an engagement gift for Baron Eduard de Rothschild. 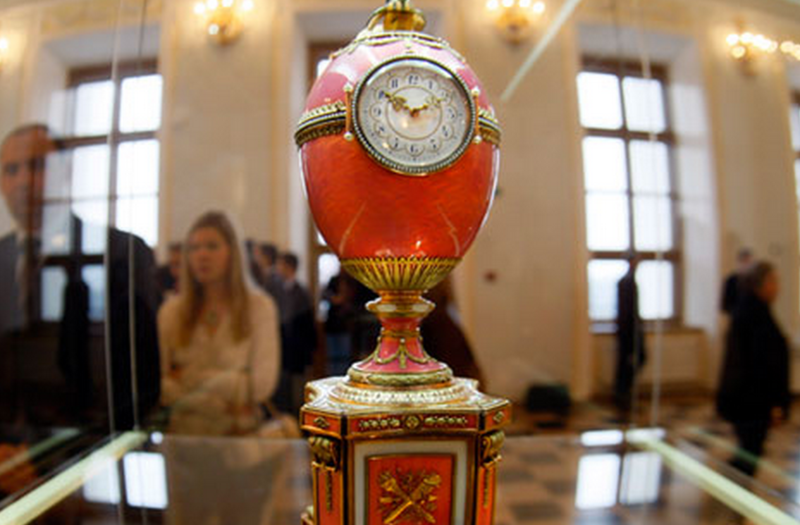 Russia Beyond the Headlines: When it comes to Fabergé, you buy across all categories, regardless of price and medium. Do you intend to create a comprehensive collection? 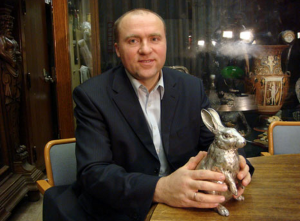 Alexander Ivanov: As you know, I buy for my museum. Apart from that, I buy a lot at European decorative arts sales. One can always find outstanding objects, from Germany in particular. That type of art I collect for my own pleasure. Recently I bought a diadem because it belonged to the Russian empress – something that no one realised. We paid only £60,000 for it, which is very cheap. You can just look at the photographs of the empress where she is wearing this exact diadem. 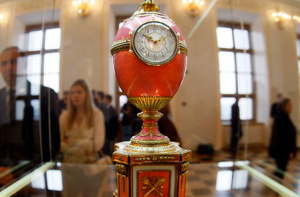 RBTH: Last year there was a sensation when Wartski announced the discovery of a third Fabergé egg, believed to have been given by Alexander III to Marie Feodorovna for Easter 1887. Have you seen this egg? A.I. : I don’t acknowledge this egg as genuine. There are scholarly catalogues where all the imperial eggs are described in detail, including the one in question. In my museum we have drawings of Imperial egg designs, which we have not yet put on display or published, and which obviously shed light on the Wartski egg story. RBTH: What significant pieces have your recently acquired for your museum? A.I. : We bought over 500 objects recently, including some outstanding pieces of Inca gold from America, plus Scythian, Sarmatian and, most significantly, Etruscan gold dated 12-10 BC. We also have collection of 500 Fabergé animals. RBTH: How much a year do you spend? RBTH: Do you buy from across the world then, rather then just in London? A.I. : Absolutely. The best pieces are always found at regional auctions in continental Europe and in France. RBTH: Do you go to museums and galleries when visiting London? A.I. : I always go to the National Gallery and its gallery where Carlo Crivelli is displayed as well the one that has Da Vinci. It’s a pity Crivelli doesn’t appear on the market very often. As for Da Vinci, they do occasionally – I just arranged to acquire a couple. But proving that it is an actual Da Vinci is incredibly difficult. RBTH: How do you think Russian Art Market is going to evolve? Is Putin really “watching closely who is throwing money around in London,” as one British journalist told me? Tags: Alexander Ivanov, Faberge egg, Russian art market. The market is seeing a levelling off. World class pieces still get world class prices, the Middle market is less predictable and the non-conformists are dead in the water. Personally, I don’t see the return of the 19th century painting market, but I might be wrong – Russian Art has often surprised. See you in Maastricht.